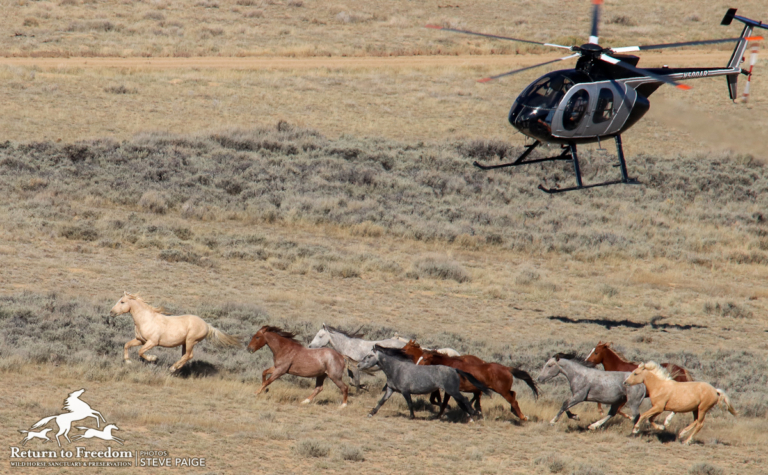 A Bureau of Land Management contractor's helicopter pursues wild horses during the recent roundup southwest Wyoming. A total of 1,958 wild horses were captured and 15 died from Sept. 25-Oct. 17. Photo by Steve Paige. A Bureau of Land Management contractor’s helicopter pursues wild horses during the recent roundup southwest Wyoming. A total of 1,958 wild horses were captured and 15 died from Sept. 25-Oct. 17. Photo by Steve Paige. The state of Wyoming and a ranching group have entered into the latest in a series of contentious lawsuits over the presence of wild horses in southwest Wyoming, pitting wild horse advocates against the Bureau of Land Management. On Tuesday, Wyoming and the Rock Springs Grazing Association were granted permission to enter the current dispute over a horse gather in three regions of southwest Wyoming near Rock Springs, where the BLM recently rounded up wild horses in accordance with a 2013 settlement between the ranching group and the federal government. Wild horse advocates have repeatedly argued that the BLM illegally implemented that settlement, which sought to keep the number of wild horses in the region within federal population targets. Livestock operators argue that wild horses damage the range. The 10th Circuit Court of Appeals ruled in favor of the horse advocates last year, determining that the BLM’s attempt to remove all wild horses from the checkerboard of public and private land adjacent to Interstate 80 was illegal because it treated both the public portions of that land as though they were private parcels not subject to federal law governing the treatment of wild horses. But U.S. District Court Judge Nancy Freudenthal declined to halt the most recent gather, which took place over several weeks in October, despite claims by the horse advocates that the BLM failed to properly conduct an environmental review prior to the gather and that it was removing horses less than 1-year-old but not counting those horses against its total removal goal. “Delaying the gather would allow the wild horse population to expand, wasting the BLM’s scarce resources invested in organizing the proposed gather and forcing the BLM to lose out on the costs it has already incurred,” Freudenthal wrote. Despite the wild horse gather concluding on Oct. 17, the lawsuit is continuing and will likely address both whether the BLM took the steps required before starting the gather and whether the agency may choose not to include young horses within the total removal counts in the future. The State of Wyoming and the grazing association sought to enter the lawsuit shortly after it was filed but the request was only granted on Tuesday. Senior Assistant Attorney General Erik Petersen wrote in his motion to join the case that Wyoming had a legitimate interest in the case because it owned a significant portion of the land on which the wild horses were being collected.